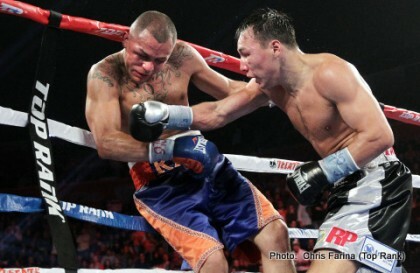 Ruslan Provodnikov (23-2, 16 KO’s) ended the brief reign of WBO light welterweight champion Mike Alvarado (34-2, 23 KO’s) by defeating him by 10th round stoppage tonight in a two knockdown victory at the 1STBANK Center, Broomfield, in Denver, Colorado, USA. In the 10th round, Provodnikov staggered a tired and badly beaten Alvarado, pummeling him with powerful shots for the last minute of the round. Alvarado was ready to go in the last 20 seconds of the round while trapped against the ropes badly hurt. Somehow Alvarado made it out of the round, but there was no way that he was going to be able to make it through the 11th. After the round, Alvarado’s corner wisely halted the fight rather than letting him come out for the 11th and get finished off by Provodnikov. The fight was pretty much even going into the 8th round, but Provodnikov changed all that after nailing Alvarado with a big left hook to the head. Provodnikov knocked Alvarado down twice in the round. Referee Tony Weeks would have been doing Alvarado a huge favor had he stopped the fight after the first knockdown where Alvarado got up at the count of 9, because he was never the same after that knockdown. You’ve got to wonder whether the strain of dehydrating down to 140 lbs. was ultimately too much for Alvarado to take because he looked to be weakening by the 6th round. He was fine for the first 5 rounds, but from the 6th round on, Alvarado looked drained. He rehydrated from 140 lbs. to 157 lbs. for the fight. That’s 17 pounds of water weight that Alvarado put on. That’s a ton of weight for most fighters to put back on. Guys like Julio Cesar Chavez Jr. can that kind of weight back on without too many ill affects, but a lot of fighters are drained when they take the kind of weight off that Alvarado did. He needs to think seriously about moving up to at least welterweight. If he’s going to be rehydrating to 157, then he needs to be fighting at 147 at least. It would be nice to see a rematch between Provodnikov and WBO welterweight champion Tim Bradley. Provodnikov was beaten by Bradley by a close 12 round decision last March. It’s doubtful that Bradley will take another tough fight against Provodnikov because he wants to fight a rematch with Manny Pacquiao and/or face Floyd Mayweather Jr. Perhaps when Bradley is done with one of those two fighters we might see a Bradley-Provodnikov rematch. Former lightweight champion Juan Diaz (38-4, 19 KO’s) beat Denver fighter Juan Santiago (14-11-1, 8 KO’s) by a 10 round unanimous decision. Diaz hit Santiago with his best shots for 10 rounds, but he was unable to seriously hurt him. Santiago took the shots and would just keep coming forward looking to land his weaker shots. Diaz’s team obviously scouted Santiago well and noticed that he had zero power. It was the perfect opponent for Diaz, because he does not look ready yet to be facing anyone with power. Santiago gave Diaz trouble as it is with his weak punches. Diaz might want to reconsider the idea of making a comeback unless he’s just looking for one big cash out fight. In that case, he should be very careful who he fights before he gets that big money bout because I think he’ll lose if they put him in with a halfway decent lightweight. Diaz may have been a great fighter in the past, but he’s 30-years-old now and been out of the sport for a long time. I think the sport has passed him by.